The Defence Ministry is preparing dossiers to be forwarded through diplomatic channels to different countries regarding the ban on 16 overseas Tamil Diaspora groups and 424 persons allegedly linked to terrorism, a spokesman said yesterday. The External Affairs Ministry issued the gazette notification banning these groups for alleged involvement in reviving the LTTE, a terrorist movement, defeated in May, 2009. It was done on the recommendations of the Defence Ministry. 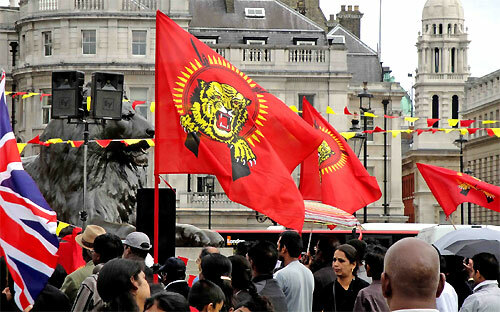 Among the proscribed organisations are the LTTE’s Trans National Government of Tamil Eelam (TGTE), the Global Tamil Forum (GTF), which is active in Europe, and the UK-based British Tamil Forum (BTF). The proscription was done under UN Security Council Resolution 1373. Following the ban, numerous countries made inquiries about the circumstances that led to the proscription of these organisations. Afterwards, the External Affairs Ministry, backed by the Defence Ministry, briefed the diplomatic community accredited to Colombo. Sri Lanka also asked the relevant countries to classify the organisations as terrorist outfits that were promoting separatism in Sri Lanka by various means. However, the representatives of some countries asked the Sri Lankan authorities to substantiate its allegations against these organisations with sound evidence. Accordingly, the Defence Ministry is now planning to submit evidential details to these countries. Military spokesman Brigadier Ruwan Wanigasuriya said the ministry would prepare separate dossiers to be sent to the various countries. Meanwhile, Canada and the United States have already announced that this ban had no binding effect on them.